Cyberattacks on mid-market companies are on the rise. In response to the growing number of the threats, companies are becoming increasingly aware of the need to strengthen their cybersecurity posture. However, identifying what makes a posture ‘strong’ is leading to a dissonance within the mid-market space. What challenges do mid-market companies often face when managing their security internally? Why are many mid-market companies turning to managed security service providers (MSSPs)? What are the benefits associated with a managed security operations center (SOC) service? 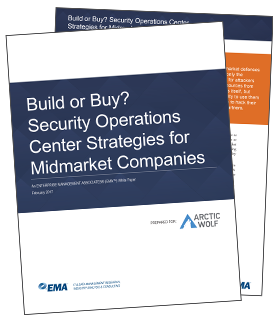 How is Arctic Wolf's AWN CyberSOC™ service different from other providers and what makes it a viable option for mid-market companies?